There are endless systems to help you track your task lists, but what about when it comes time to actually do the tasks? 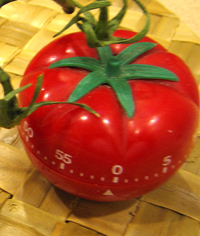 Batching (and its most commonly known child, the Pomodoro Technique) helps you manage your time as you’re actually doing things by collecting it into batches, or chunks of time devoted to a single task. Every time we become distracted, it takes an average of 15 minutes to regain complete focus. Unless you are intentionally managing your time, there is a very good chance that you operate in a constant state of unfocused response. Joshua Leatherman has written an excellent introduction to batching and, specifically, the Pomodoro Technique. See it now at How to Use Batching to Become More Productive. Category: Time & Task Management | Tags: batching, pomodoro | Permalink | Post a comment | Trackback URL. Great post and reminder. I’ve heard of this idea bfroee, from one of the other pastors when I was a children’s pastor. It really helped me to use blocks of time, instead of 15 minute tasks.I use it a lot when blogging / writing. It helps me get ahead of schedule with my posts.But if only I could learn to write faster . . .